History Books - Books on Sports - Sport Books: Catalog of books about your favorite sports. 2019 History books on sale now. Buy your 2019 History books with us today. We have many History books to choose from and each purchase comes with the ease and convenience of Sportspool's online experience. We hope you find the History book that is perfect for you! 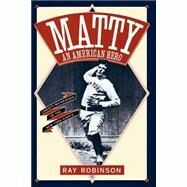 "Drawing on rare interviews, press clips, and eyewitness accounts, Robinson tells the story of baseball player Christy Matthewson, a man who became America's first authentic sports hero, and who showed an eager public that a real-life role model could be found in the athletic arena. Photos."